Often, when I want to express emphasis I write “soo” instead of “so.” And even if no one else thinks this should be generally adopted, I think I’m right and they’re wrong. This isn’t just about how the internet and social media have impacted modern language developments, although they’ve done so tremendously, as evidenced by the decade-plus of serious scholarly work on the subject, and although this does factor in, in a very real way. Consider the following sentence: I am going to send Hannah an email so she knows that I find this blog so insufferable. The first so expresses causation, the second expresses intensity. These are different words. They just look the same. So what? you are thinking. Homographs are just a characteristic quirk of the English language. This is true, but there’s reason to rail against this particular one; after all, the homonyms to and too provide not just a perfect parallel illustrating how one of the more confounding of these quirks can be fixed, but a precedent, too. Is a new spelling variant arising (naturally) to separate out one of the senses of so (there are 8 main ones categorized in the [Oxford English Dictionary])? That is what happened with to and too—they both come from the same word but the ‘too’ sense got its spelling in the 16th century. Same with off and of, they were the same word until they weren’t. A-ha! Now, Okrent cautioned that the distinctions between to and too and of and off were made back before English spellings were standardized, when it was easier to make adjustments. The rise of the printing press, which popularized certain spellings over others, created the first true set of conventions. “It was in constant flux until it all settled,” Okrent said. 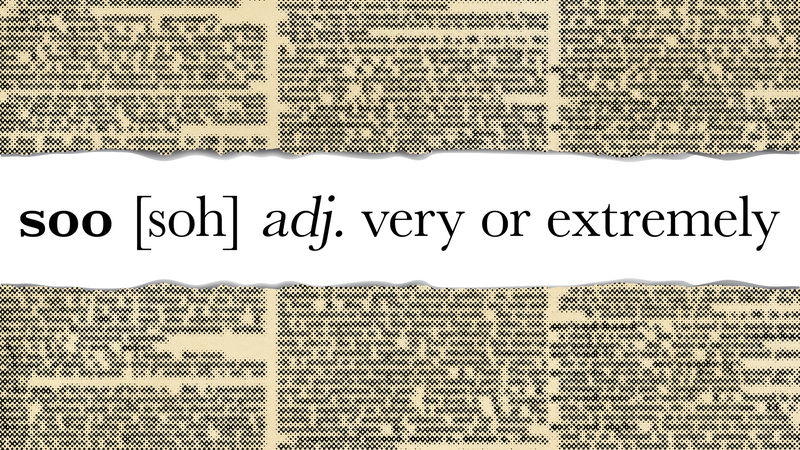 We don’t really have that kind of official flexibility these days—the AP just decided we can stop capitalizing “internet”—but the dictionaries follow colloquial usage anyway, and that is constantly evolving. Okrent speculates that the rate of informal language change has likely sped up as a result of the rise in “spontaneous written communication,” which allows people to see specific spelling and usage changes more clearly than in spoken communication. This means if we all start using “soo,” it could spread quickly and force the dictionaries to adapt. But even if you don’t, I’m still going to think there should be a so and a soo. So there.